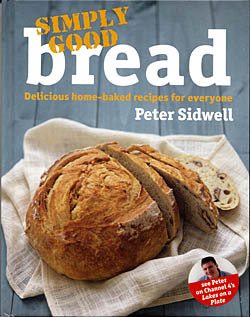 Nothing beats the smell and taste of freshly baked bread and Peter Sidwell has created over 50 delicious, easy-to-follow recipes for baking loaves using either conventional methods or a bread-maker. Simply Good Bread is packed with dozens of ideas to suit every mealtime and occasion: you'll find everyday breads such as French Onion Bread to make a simple lunch really special; Sun-dried Tomato and Thyme Loaf that's perfect for a dinner party; and Peter's favourite Cumbrian Whigg Bread - great for family picnics. With this book you too can enjoy the wholesome goodness and versatility of home-made bread. Anyone who knows Peter Sidwell’s bistro, Good Taste, in Lake Road in Keswick will know how fanatical he is about his bread. Bread may be a staple of family food, but with inspiration and imagination it can come in all shapes sizes and, above everything, tastes. That basic mixture of flour, yeast and water can be the basis for the simplest and the most sophisticated of dishes. Equally warming, and with a good, sharp taste, is chorizo and blackened chilli bread. All you do is dice the chorizo and make sure you chop the chilli very finely after it has been blackened in a flame and then add it to the bread mixture. The possibilities seem endless. Peter offers mozzarella and cherry tomato loaf, mustard and tarragon swirl, ciabatta with black olives, and cider apple or fennel and sultana bread among many others. If you fancy ethnic food you might try your hand at making a naan with cumin and black onion seeds. It looks fairly easy, simply a case of toasting the seeds in a dry frying pan, making a dough with flour, yeast, salt, sugar, yogurt and water and then placing on a baking tray in a hot oven for ten minutes. The resulting singed bread looks perfect for mopping up those rich, aromatic curry sauces. Just as ethnic are Johnny cakes, which originated in the Australian outback. All you need is flour, salt, white pepper and chopped sun-dried tomatoes and – here’s the ethnic touch – one 300 ml bottle of beer. Throw the ingredients together in a bowl and get the dough to a manageable consistency and then divide it into handy sized pieces and cook them over a barbecue grill for a few minutes. You can even make twisters by rolling out thin strips of dough and wrapping them around a stick before cooking. Judging by the pictures, the cooking is best done by lying comfortably on the ground watching the grill with a bottle of beer close at hand in case of emergencies. If you are fearful that all this bread may not be the royal route to a healthy diet Peter is also able to offer Chelsea buns with super foods, packed with the anti-oxidants found in cranberries and blueberries. Or you might try getting your five a day with the aid of banana bread, described as “incredibly more-ish and packed with instant energy”, or by eating an apple strudel toastie which is made by adding apple sauce, sultanas, mixed spice, sugar and lemon zest to any brioche that might be left over and placing it in a toasted sandwich maker. One of the most attractive of family recipes is for duck bread. This tricky dish involves removing stale, unwanted bread from the bread bin and placing it in a re-usable plastic bag, taking the children and the said re-usable bag down to the lake,breaking up the crumbs and, finally, throwing them to the ducks. Making bread can be a very satisfying experience. Peter Sidwell’s enthusiasm, imagination and the sheer delight he takes in flour and water are the perfect advert for the good life.